Okay, before I start my review of "There Will Be Blood" you have to understand that I'm a sucker for those "journeys into the heart of darkness" type flicks. Apocalypse Now, No Country For Old Men, Fargo, and now Paul Thomas Anderson's There Will Be Blood. I went to a late showing of this film last night with a couple of friends and found it hard to stay awake, not because I wasn't impressed, I was just tired. I've only seen one of Paul Thomas Anderson's other films, the incredible "Punch-Drunk Love" starring Adam Sandler, and I couldn't think of another film that is more of a departure from that world. "Blood" begins with a very drawn out opening sequence where not a word is spoken, but the phenomenal cinematography speaks for itself. We follow up and coming oil tycoon Daniel Plainview as he goes from working as a small silver miner to turning oil into big business. He then adopts the infant son of his co-worker who dies on the job and turns young H.W. into more of a business partner than a son. He is a cutthroat misanthrope that descends into his own paranoia and loathing for people as the film progresses. There Will Be Blood may not be for everybody because it has a very negative tone to it, however it is visually stunning and the soundtrack is most definitely original. By the end of the film (which really reminded me of the Coen brother's epic No Country For Old Men) we have seen Mr. Plainview's obsession come full circle, culminating in a final showdown with the preacher Eli Sunday. Sunday's character is also a fascinating figure. He runs "The Church Of The Third Revelation" which strikes me as a remnant of the Great Awakening given it's very hellfire and brimstone approach to everything. The major conflict between Sunday and Plainview lies in the fact that they are so similar to each other that the other one must cease to be for them to continue on with their "life's work." 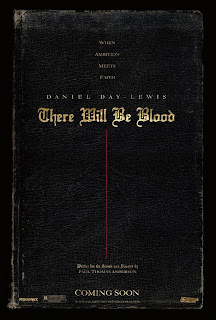 All in all, There Will Be Blood was an incredible character study that delves deep into what makes these men tick, and how dark one's world can become when obsession takes the place of ambition. Also, watching a great director work with a phenomenal actor really adds something to the film-going experience and we are most definitely treated to that here with the Paul Thomas Anderson/(going to get the Oscar this year) Daniel-Day Lewis.